A Lemon Grove woman was in custody Friday morning on accusations she fled on foot after crashing her car into a parked SUV on a Lincoln Park roadside Sunday morning, gravely injuring a 79-year-old man riding in her vehicle. 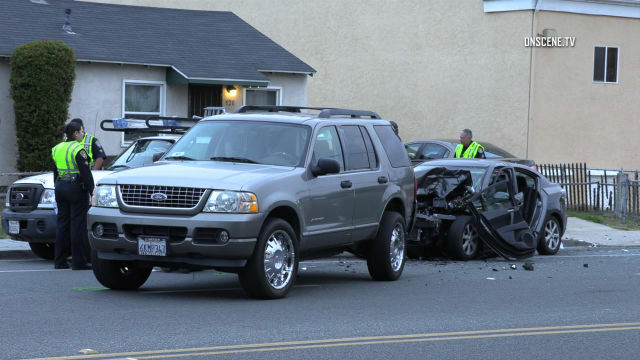 Police on Tuesday asked for public help to identify the suspect in the crash, and a tip submitted Thursday to San Diego County Crime Stoppers led to the arrest later that day of 53-year-old Deneen Elizabeth Grear, San Diego police traffic-division Sgt. Victoria Houseman said. Detectives found and arrested Grear at a location in the 7300 block of Broadway in Lemon Grove, and she was booked into the La Colinas Detention Facility on suspicion of felony hit-and-run causing injury. She remained jailed Friday morning in lieu of $50,000 bail, jail records showed. Police believe Grear was the woman driving a 2010 Mazda 3 about 5 a.m. Sunday in the 500 block of South 47th Street when she veered right and struck a parked SUV. The Mazda’s driver got out of the damaged car and walked away, leaving behind her two passengers. One of the men had been unrestrained in a back seat at the time of the crash and suffered severe head and neck trauma. He was hospitalized in critical condition and was not expected to survive his injuries, police said. A 39-year-old man who had been riding in the front passenger seat suffered minor injuries. Due to the severity of his injuries, the older passenger was unable to give police a statement, according to Houseman. The younger man, for his part, told investigators he had only recently met the woman and “could not provide any information regarding her identity,” the sergeant said. Surveillance cameras from a business she visited that night captured images of the suspect. She was described as a black woman who appeared to be in her 50s. Jail records show Grear is black and 53 years old. An arraignment was tentatively scheduled for next week, but police said the investigation was still ongoing, and anyone with information was asked to call San Diego police at (619) 531-2000. Anonymous tipsters can contact San Diego County Crime Stoppers at (888) 580-8477 or sdcrimestoppers.org.